Micro SD cards are the most widely used memory cards around. Micro SD cards are used in variety of devices that include smartphones, tablets, digital cameras, camcorders and other other electronic devices. The storage capacity of microSD cards have increased to a great level over the time. Along with the increase in storage capacity they have become much faster and offers great performance. Micro SD cards are available in different speeds and capacities. High speed microSD cards are a bit expensive than their slower counterparts, but they offers great performance and much faster transfer speeds. For devices that requires faster data transfer operations such as high-end smartphones, digital SLR cameras, handy cam or video recorder, you will need a high speed microSD card otherwise they will not function properly and there will be a huge loss in performance too. microSD card of 32GB capacity is more than enough for most of the users as it has adequate storage and is not expensive either. You can find a good branded high speed 32GB microSD card under 1000 rupees in India. Here in this post I am going to provide you the list of best high speed 32GB microSD cards that you can use in you smartphones, cameras, camcorders for Full HD (1080p) video recording and playback. These are all UHS-1 Class 10 microSD memory cards for high performance devices. Note: You need a UHS-I capable device to run UHS-1 memory card at UHS-1 speeds. You can also use these microSD cards in the hybrid SIM slot of your smartphones if you have got one. Here are the best high speed 32GB microSD cards that you can buy online in India for your high performance devices. SanDisk is one of the largest manufacturers of memory cards, pendrives and flash storage devices. It is also very popular in India because of its wide availability and reliable products. Here we have SanDisk Ultra MicroSDHC 32GB UHS-I Class 10 Memory Card. This is a high speed memory card that can be used in smartphones, tablets, cameras etc. This microSD card is suitable for high performance tasks such as Full HD video recording and playback. This microSD card is Waterproof, temperature-proof, shockproof, and X-ray proof. This 32GB memory card has got read speed of up to 80MB/s and around 15 – 20 MB/s write speed. It comes with SD card adapter and is compatible with SD/SDHC/SDXC devices. You can download the SanDisk MemoryZone App and can easily manage your files on the card. Samsung is a big company that makes various consumer electronics and computer products including LCD, TV, Smartphones, Hard drives, SSD etc. It also makes high quality memory cards for high performance devices. 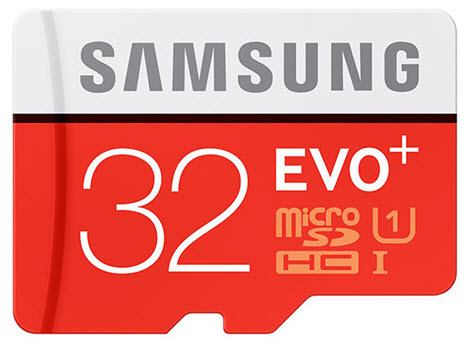 Here we have Samsung EVO Plus 32GB microSD memory card which is a UHS-1 Class 10 high speed memory card. This is one of the fastest microSD cards that you can get in the market. It has Read Speed of up to 80 MB/s and Write Speed of up to 20 MB/s in UHS-1 mode. This high speed microSD card is suitable for smartphones, tablets, digital cameras etc and it supports 1080p video recording and playback. This is a high quality and reliable microSD card which is waterproof, temperature proof, magnet-proof, X-ray proof. You can get this Samsung microSD card at a great price from the link given below. Highly Recommended by me. Strontium may not be that popular as SanDisk and Samsung in India but it is a very good flash memory devices manufacturing company from Singapore. 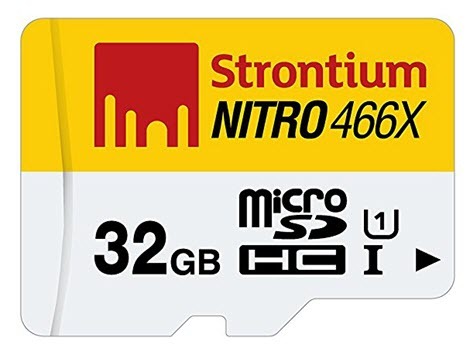 Here we have Strontium Nitro 466X 32GB UHS-1 Class 10 microSDHC Card which is a high speed microSD card for use in smartphones, tablets, cameras, camcorders etc. It does support Full HD (1080p) video recording and playback. Strontium Nitro 466X microSD card has read speed of about 70 MB/s and write speed of around 20 MB/s. It comes with in-built write protect switch that comes in very handy and prevents your data from accidental deletion. The card is durable and is waterproof, temperature proof, magnet-proof and X-ray proof. Kingston is a highly reputed company that makes computer memory and flash storage device. You might have known it from pendrives because Kingston pendrives are very popular in India. 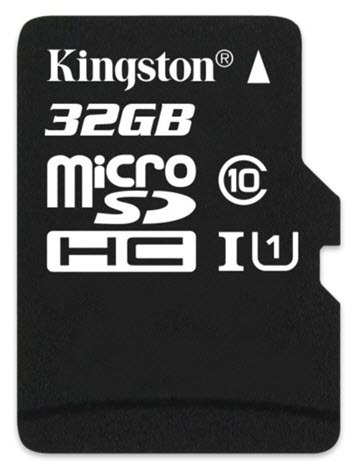 It also makes high speed memory cards and here we have Kingston 32GB microSDHC Class 10 UHS-I Memory card. 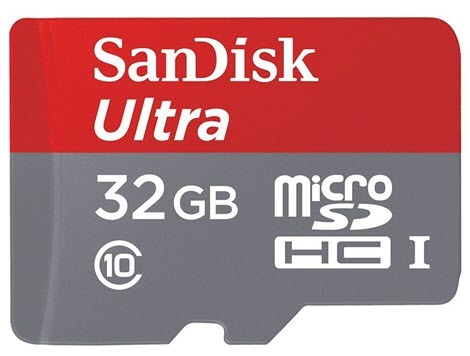 Like others microSD cards in this list, it is also an Ultra High Speed (UHS-I) and Class 10 microSD card that fully supports Full HD videos and 3D videos. The maximum transfer rate this card can achieve is 80 MB/s and it is Water Proof, Shock Proof, Vibration Proof, temperature proof and X-ray proof. Transcend products are always of high quality whether it is RAM or other flash storage device. 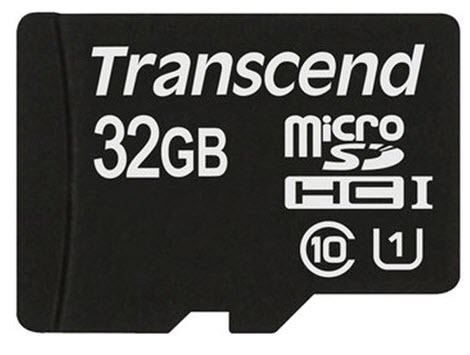 Here we have Transcend microSDHC Class 10 UHS-I Premium 32GB Memory Card that has up to 60 MB/s transfer rate. It can be used in smartphones, tablets and supports Full HD video recording. This high quality microSD card has built-in Error Correcting Code (ECC) to detect and correct errors related to data transfer. This microSD card is waterproof (IPX7 standard), temperature proof, static proof, X-ray proof and shock proof. Many people are not aware of this company Lexar but I must tell you that it is one of best companies for memory cards. It is an American manufacturer of flash storage devices and its parent company is micron that makes high speed memories for graphics cards, high-performance servers and other high performance devices. 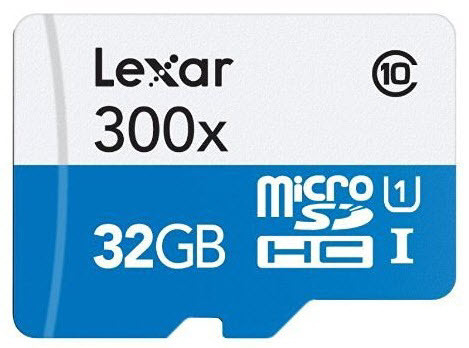 Here from Lexar we have Lexar High Performance microSDHC 32GB 300X UHS-I C10 Memory Card which is a high speed professional microSD memory card for smartphones, tablets, camcorders. This microSD card has read speed of about 45 MB/s and high write speed of around 24 MB/s. This card is suitable for playback and recording of Full HD, 3D and 4K videos. On this 32GB microSD card you can store up to 8 hours of HD video, 24800 photos or 14200 songs. It comes with a SD card adapter for use in other devices. Well here I have listed down the best high-speed 32GB microSD cards for smartphones, tablets, cameras and camcorders. These are all reliable microSD card from highly reputed brands. If you have queries regarding them then you can ask me by leaving a comment below.